Le Guin, Ursula K. (1969). The Left Hand of Darkness. Ace Books; New York. You can read a lot of great reviews, analyzes, and summaries of The Left Hand of Darkness online (for an example, check out the humorously-written cheat sheets over at Shmoop). Indeed, this Hugo and Nebula Award-winning novel has been critically acclaimed since its publication in 1969 and deserves continued attention and interest from readers. Under this Book Delights portion of my blog, I’ve mostly been playing catch-up with books that I’ve read over my lifetime – rereading them and then recording my impressions. Though I have owned a copy of The Left Hand of Darkness since 2006, this was the first time that I’ve sat down and read it. Given the mature content and advanced themes of the book, it would have held much less meaning to me as a younger person. I’m glad that I picked it up when I did. The story follows Genly Ai during his journey as an Envoy on the frozen planet Gethen, also called Winter (Wikipedia article). Like many science-fiction novels, there are layers of complexity and world-building as context for this individual novel; The Left Hand is part of the fictional Hainish universe, first introduced in Ursula’s 1966 novel, Rocannon’s World (Wikipedia article). In this ongoing series, humanity spreads from their initial home world (Hain) across the galaxy, eventually leading to an 83-world collective called the Ekumen (Wikipedia article). Genly’s task as an Envoy on Winter is to bring the local people into a communication- and trade-based alliance with the broader Ekumen. Reading the book is an experience in the abstract. The planet Winter is covered in snow and the lives of its peoples are controlled by the unending, unbearable, unbreakable cold. You will feel like you are standing in a blizzard, your vision greatly reduced and your outstretched hands your only guide, as you read this novel – nothing is predictable and your familiar context of understanding will be shaken. It is also written in the form of a ‘space log’ by Genly Ai and the other central character, Estraven. The chapters jump around quite a bit, and their names are lengthy and numerous; consequently, I was often confused about the context for each chapter despite the engrossing nature of the tale. There are frequent forays into short stories within the overall plot. These short stories sound very much like fairy tales, and feel deeply symbolic. The novel is among the first books published in the feminist science fiction genre, and has been described as a “thought experiment” to explore society without the opposing genders and their feelings of sexual attraction as a race (Wikipedia article). The inhabitants of Winter are androgynous and asexual – once a month (in a state known as ‘kemmer’) they become sexually active and one individual takes on the role of male, the other female (Wikipedia article). 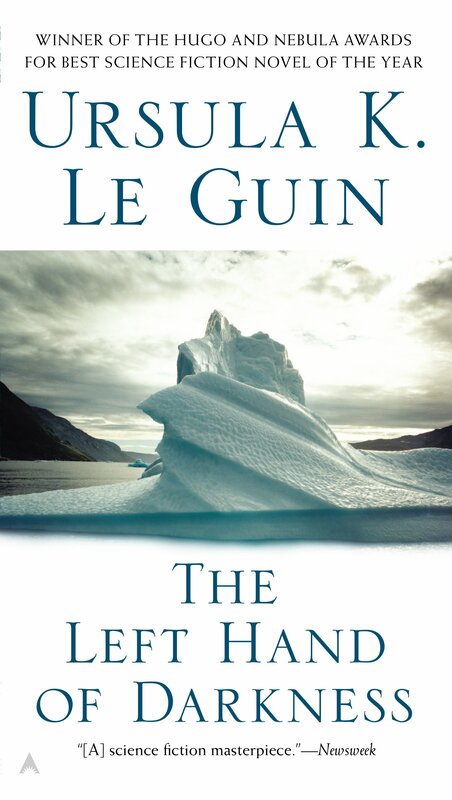 “….a fictional concept in Le Guin’s Hainish Cycle universe, first introduced in The Left Hand of Darkness. It comes from an old Gethenian word for shadow. The concept is used by Karhidians only. They, being portrayed as the darker nation or Yin (in the idea of Chinese Tao) use this concept as a way of showing respect while on Orgoreyn they do not use shifgrethor but instead act in a direct manner with a falseness beneath it (they, seen as the lighter nation, or Yang)” (Wikipedia article). Despite all the strangeness, feelings of attachment grow between Genly and Estraven. Estraven holds a storied past, complete with an incestuous relationship with his brother (despite the feminist tilt of the novel and the supposedly gender-free characters, the male pronoun is used exclusively to describe people). This cesspit of complex inter-personal relationships follows the pair’s dangerous escape from the Farm in Pulefen and subsequent race for survival across the Ice. If you’re looking for a deep and thoroughly complex novel, The Left Hand of Darkness is sure to please. I am already anticipating sitting down with my next experience inside of the fantastic, imagined Hainish world!